Many people don’t like removing their wedding band, but it’s not always practical—or even safe—to wear. 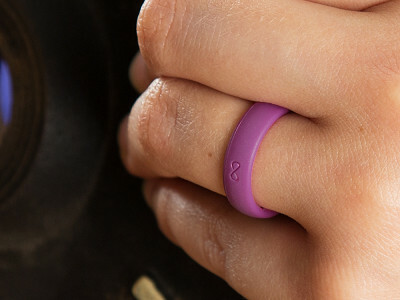 That’s when Groove bands come in—comfortable, breathable silicone rings that won’t get in your way. Founder Peter Goodwin runs an adventure lodge in Alaska, where his active lifestyle and his metal wedding ring didn’t match. He tried other silicone bands, but they were bulky and left his finger pruny. So he created Groove—a flexible ring with grooves that let your skin breathe. The firm inner layer feels like a traditional band and fits snugly against your skin. And because it’s liquid-injected, there are no irritating seams. This ring won’t scratch or dent and if it catches on something, there’s no risk of it injuring you. Groove comes in a carry tin that’s the perfect place to store your regular ring while it’s off your finger. If you work in a hospital, with food, or with machinery, this ring is a great alternative to declare your relationship status. Or if you’re someone who plays sports, works out hard, or wants to leave your expensive wedding ring behind while traveling, Groove has you covered. Hello everyone! I'm proud to introduce Groove Rings to The Grommet. I'd be happy to answer any questions you have! Do you have a ring sizer that can be used to find the correct size to order? @Lori Hey Lori! Checkout the sizing chart. Make sure to print at 100% on your printer settings!!! Thanks a ton and keep Groovin! I think this is a great idea . I am a runner and I also do cross fit so I do not wear my wedding band most days . Where is it made ? I would really like to start buy US MADE products if possible. But totally love the ring ???????????? @Michael Thanks a ton for your comment and question! The rings are made in Asia! We tried REALLY hard to find a supplier in the states that was resonably priced but nothing was even close. We are talking 7-10 times the price for prototyping, molding and product. We are continuing the search and may even begin our own production stateside as the company grows. FYI: we stand behind our product and have a lifetime warranty on your original purchase. Thanks again and keep Groovin! @Terry Our rings are perfect for you!! My knuckles are similar to yours which is why I absolutely love these rings! The ring will stretch to fit over your knuckle and return snuggly on your finger to its original size. Groove is also super comfortable compared to metal. You really won't even notice it after a day or two. Thanks for your question Terry! Groove on! @Peter My size is a 7 but the knuckle is 10 by your chart. Will it really fit over my knuckle? Peter, do Groove Rings fit like my metal rings? @Mark Groove Rings ultimately fit like metal rings. But remember, metal rings usually are hard to fit over your knuckle when they fit snug on your finger. With Groove Rings, they will stretch a bit, over your knuckle, and should fit snug on your finger. 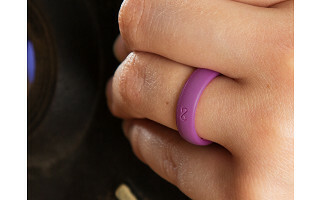 The 'groove' design lets your finger 'breathe' even with a snug fit. We recommend sizing DOWN for half sizes. @Guest Are you seeing the "Add to Cart" button? After you click on that, it will give you shipping options. @Jennifer Your friend is already 'Groovin'! Groove Rings are perfect for electricians, policemen, firemen, military.... or any active lifestyle! My husband works outside and often with machinery. He has very large hands. What is the largest size band you make? @Tiffany Thanks for the question. You can reference our sizing chart, which should help you with making a decision. @Tiffany Hey Tiffany the largest band we currently make is size 14. We hope to have more sizes in the near future! Thanks for reaching out! @Monica Apologies for the hiccup! Our team is working on fixing the problem now. I'll let you know when it's been resolved and you can order. If I buy a ring and it doesn't fit do you have an exchange policy? @Matthew & Meghan You bet! We have a free exchange policy! If your rings don't fit perfect, even after a week or two, we will exchange for free. That combined with our lifetime warranty really makes it a no risk purchase! Make sure to use our sizing chart before you order. It is specific to our rings so even if you know your metal ring size it may be different from the Groove ring. Thanks for reaching out!! Are you kidding? $30.00 for a rubber ring. @j First off thank you for your comment. Here is a little information on what makes Groove different from other silicone rings. Groove is manufactured using a two-part process meaning the ring features a slightly more dense inner ring, and a softer, more supple outer ring. This allowed us to create an inner arch and create a lower overall profile for maximum comfort. If you turn a traditional silicone ring inside out, you will see a dish or saddle shape, meaning its flat on the inside. If you turn a Groove ring inside out, it will be flat, meaning the inner arch is present. Our rings are also liquid poured instead of 'pressed' which means the inside grooves and other features of the ring should be perfect with little to no parting lines. The main factor that many people choose Groove is the breathability that the ring offers. Our breathable ring is patent-pending and has proven to not trap moisture between the ring and the wearers finger, which reduces the clammy feeling that some people experience. The two-tone color is also an attractive feature in our ring, albeit not seen unless you are playing with it and/or showing it off. Lastly, our ring offers a lifetime warranty and we will even replace it if you lose it and it is completely your fault. I hope that wasn't too much but I thought I'd give you as many details as I could. Again, thank you for your interest and if you choose to trust us with your hard earned dollars, we aim to ensure you get more than enough value out of your purchase. Cheers! @Jules Or it could just be an outrageous price for a few grams of silicone. This kind of mentality is exactly what is wrong with our country. The immeasurable degree of greed along with more and more people just trying their best to fleece the next person out of every single dime they can get from them is completely out of control in this county. Make a quality product and sell it for a fair price. I don't care what the process is that's required to make the ring; it's just not a price point that many people are going to pay. If it is that expensive to make the thing, then maybe it's not worth taking it all the way to market. Make a fair profit without trying to scam people out of their hard earned money. In the end it just makes one ashamed to be be an American. Thanks, Bob. In this case, the process plays a large part in creating such a quality product as Peter said above. It's what separates them from the kind of company you're describing. This solves a huge practical problem for a lot of people while quelling a pretty big fear. If you or anyone else is feeling brave, Google "Jimmy Fallon finger injury." If you're married, I think that's $30 well spent to help avoid that. Really wish you had more color options besides black and purple for the thin ring. Any other colors coming? @Deana Yes, we will be rolling out Glacier Blue in July and a new color every month there after. Stay tuned! I've looked at a number of silicone rings and really like your design. The video shows different colors, but they aren't listed in the purchasing options (specifically the silver). Will you be offering additional colors? Thanks! @Jenny We originally offered the silver ring but after countless attempts at perfecting the ring have decided to discontinue for now. However, we are still working hard with other methods to produce a silver ring in the future. We can't say when but we have high hopes. Sorry for the inconvenience and thanks a ton for reaching out!!!! Very excited to find your site! My husband's finger gets gross and soggy under his metal ring, so he doesn't like to leave it on. Also, he is a musician and finds it bothers him when it clatters against instruments. Awesome Jenny! We know he will love it!!! My husband works in an autobody shop and doesn't wear his ring in case it catches on something. Would this ring "break off" if it were caught on something high powered? He is worried about losing a finger. Yes, that is really the main reason for the rings design, besides comfort. These rings will stretch and eventually break under minimal pressure yet are sturdy enough to hold up to daily abuse. Thanks for the questions Jackie!!! are these going to be available in other color choices? Yes, we will be offering a new blue color in July and a new color every month after that. Thanks for reaching out!!! @Peter is there an option to mix the colors? say choose the orange inner lining for the thin black instead of blue? My husband and I were just talking about his ring last night. He works in an environment that makes wearing his ring dangerous and he said that there has to be something out there that can be worn that is safe. This looks like it. I plan on showing him this ring this evening and if he likes it, will be buying one. Wow talk about timing! Yes, these rings are perfect for the working person. I personally am very active and never wore a metal ring. Groove is designed to breathe as well which makes it perfect for active people who may sweat or wash their hands alot. Buy with confidence since we have a free exchange policy and lifetime warranty! Thanks Patricia!!! @Peter @Patricia I call that The Grommet effect. People have kiddingly accused us of bugging their homes because of the frequency of this "coincidence." "I.e. "I was just thinking/talking about this and then Grommet launched it!" What are the widths of the two rings? I checked out the measurements of both the wide and narrow bands, and it seems that the dimensions are of the tin the rings come in. I want to know the measurements so I know which one would look better on my finger! Thanks so much! Never mind. I went to your company's website and found that the narrow band is 5.5mm and the original is 8mm. Thanks for showcasing your product! @Diane Thanks Diane and sorry for the delay! Both rings are unisex and we have a good mixture of men and women using both! Thanks for reaching out & keep Groovin! The timing on this is amazing!!! Very interested in purchasing a pair. I just recently had to have my wedding rings cut off my finger due to 20+yrs of swelling from yrs of rheumatoid arthritis I had long ago. I've been sans ring now for over 3wks, and swelling is not completely gone but I was warned it looks like it may be permanent damage since my finger was literally squeezed this way for too long (was impossible to take rings off. Dr's told me to get them cut off long ago but I procrastinated). Been married going on 27 yrs and it feels quite strange not having some form of representation on my finger so I decided to wait and see how well it would heel and if need be, get a ring tattoo. Seeing this Grommett brought the biggest smile to my face! Perfect option for someone like me needing something comfortable, flexible breathable! My hubby said he would like to buy a pair and have this option so we match too since I am the only one w/out a ring at the moment. I like the silver thin but I see it's on backorder? How soon before it's available? Wow Alma what a great story! The ring truly is perfect for you. Unfortunately the silver is discontinued for the time being. We were unable to get it perfect in quality. Rest assured we are still working on it but for now we decided to stop selling. Sorry for this! We will have new colors coming out each month starting in July so stay tuned. Thanks again for your story and keep groovin!!! @Gregg The rings are manufactured in China. Do you custom engrave the ring? Do they all just have the infinity symbol? Many people don’t like removing their wedding band, but it’s not always practical—or even safe—to wear. That’s when Groove bands come in—comfortable, breathable silicone rings that won’t get in your way. 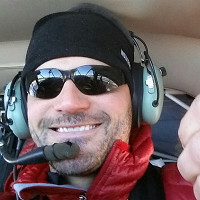 Founder Peter Goodwin runs an adventure lodge in Alaska, where his active lifestyle and his metal wedding ring didn’t match. He tried other silicone bands, but they were bulky and left his finger pruny. So he created Groove—a flexible ring with grooves that let your skin breathe. The firm inner layer feels like a traditional band and fits snugly against your skin. And because it’s liquid-injected, there are no irritating seams. This ring won’t scratch or dent and if it catches on something, there’s no risk of it injuring you. Groove comes in a carry tin that’s the perfect place to store your regular ring while it’s off your finger.